Click the "Go to Date" command on the Go menu. 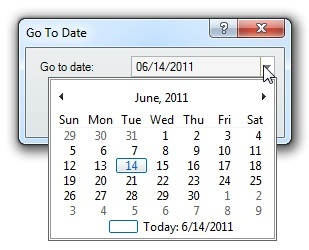 Right-click the calendar view and select the "Go to Date" command from the popup menu. Click the "Go to Date" button at the top of the desktop calendar. You can choose to go directly to a date in the Calendar View from the Go To Date dialog. This can be useful if the date you wish to see is far from the date currently displayed. The date can be typed in or selected from the drop-down calendar. 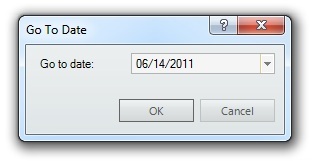 After entering the date you'd like to see, click the OK button. The Calendar View will update to display the selected date.